Damages to a Bragg Creek roof can have many causes. Some of the causes of roof damage are connected to the type of roof you have. Whether you are trying to protect and extend the life of an existing roof or you want to protect a new roof, here are some of the main causes of roof damage. Poor Maintenance: It is important to regularly inspect your roof for small problems and damages and immediately make repairs. Wind Damage: Over time any wind can loosen nails in roofing materials. When this happens, a moderate wind can damage the roof. Strong winds and flying debris can also damage a roof, often removing some or all of the roofing material. Weather Damage: Most roofing materials can be damaged over time by exposure to various weather conditions. Flashing: Because the purpose of flashing is to create a water-tight boundary between roof sections, between roofing materials and other parts of the house and between roofing materials and roof projections, problems with flashing often cause leaks. These leaks can damage the field of the roof as well as the interior of the house. Trees falling due to wind can puncture shingles and cause other damage to your roofing. Leaves clog gutter systems and back up water into attics and other spaces inside your house. What about those black streaks? Streaks on your roof are evidence of mold and as you probably know, mold is hazardous to your health if inhaled. Mold grows easily during humid periods, especially on roofs that face north. If you don’t deal with them as soon as possible, they will eat away at the roofing material, and eventually eat through it, causing leaks. If you think you are having problems with your roof and would like a roofing inspection, then please contact your Bragg Creek Roofing Contractor. 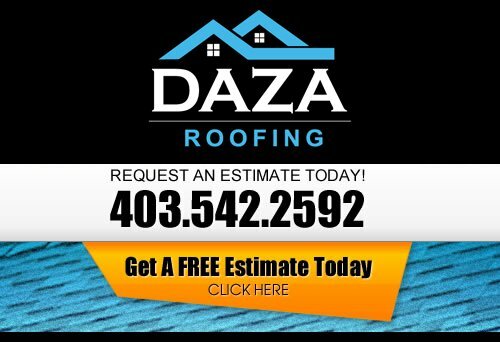 At Daza Roofing, our Roofing Contractor wants to be your Bragg Creek Roofer. There are, of course, advantages to getting a professional Bragg Creek Commercial Roofing Company to do the roofing for you. The number one advantage of hiring a Commercial roofing contractor is that you will be able to get expert feedback on what materials you need, for both aesthetic and practical reasons. If you have any questions about damage to your roof, or anything to do with style, you will be able to speak with your roofing contractor. 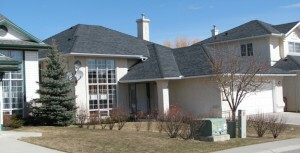 Another advantage of using a Bragg Creek Commercial Roofing Contractor is that you are ensured of having the job done right the first time, there should be maximal efficiency to the roofing contractor work, allowing you minimal time of work on your house and the absolute minimum discomfort for you and your family while the work is being done. If you are looking to get a new roof on your house, you will have to think about the way you are going to get the work done, many people think that they can do the work themselves only to later discover that they can’t, and than they are in a desperate situation that needs urgent help, which usually costs them much more than if they would have planed things right. When you are thinking of getting a new roof for your house, chances are that you will not want to go at it alone. Not only is the construction dangerous, but it is hard to select the correct roofing materials and to construct it in a structurally-reliable manner. If you are looking for a professional Bragg Creek roofing company, then please call us today at 403-542-2592 or complete our online request form for a free estimate.